Claudio won a liveaboard cruise on the S.M.Y. Ondina to Indonesia (Komodo, Fak Fak, Flores, Sulawesi and the Raja Ampat area) and 50% off for his companion. 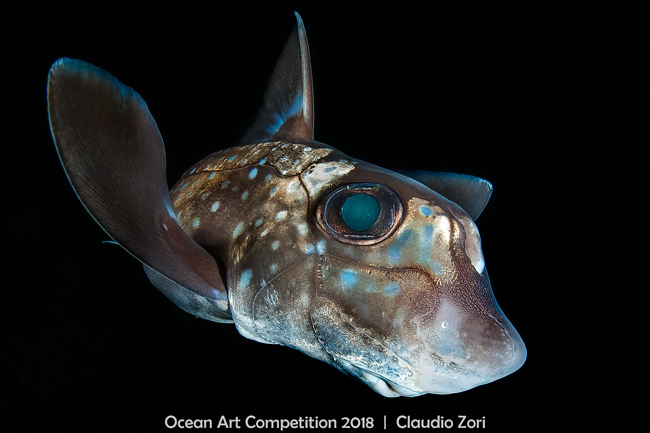 The Story: The spotted rat fish, a resident of the northeastern part of the Pacific Ocean, usually lives between 50 and 400 meters and prefers temperatures no higher than 9 degrees. However, it tends to approach in shallow water during the spring and fall. While swimming, it can perform rotations and twists as if it were flying. The photo was taken in a night dive in front of God's Pocket dive resort.